The plasma acceleration group within LAOLA is dedicated to advance plasma-based particle accelerators and further the understanding of the underlying physics. Within the scope of this research, we conduct experimental studies at DESY and at other leading accelerator laboratories. Our ability to tailor plasma targets and to control longitudinal and transverse density profiles permits the creation of matched acceleration media for a variety of laser- and electron-beam parameters. Such targets are designed, fabricated, and characterized in-house according to the specific experimental needs of various LAOLA projects. Typically, complex plasma cells with diameters on the order of 200 µm and lengths of a few centimeters are deployed to stabilize the acceleration process and obtain control over the electron capturing and phasing. 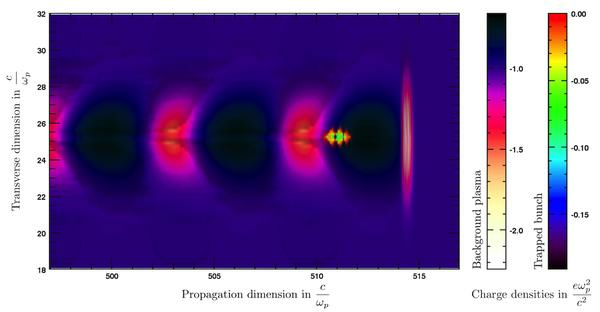 In addition to our experimental endeavors, our theory and numerics section utilizes massively-parallel particle-in-cell simulations to investigate fundamental questions in plasma-accelerator physics. A number of plasma-acceleration strategies including laser-driven and electron-beam-driven processes are currently being explored. Particular topics of interest are the direct probing and reconstruction of plasma wakefields, beam-emittance evolution, and controlled betatron radiation emission. OSIRIS 2.0 particle-in-cell simulation of a few-femtosecond electron bunch trapped in a laser-excited plasma wakefield. The electrons are injected externally with parameters achievable at a number of existing DESY facilities, e.g. at FLASH, PITZ or REGAE. REGAE the Relativistic Electron Gun for Atomic Explorations will provide high quality pC-charge electron bunches of few femtosecond lengths. 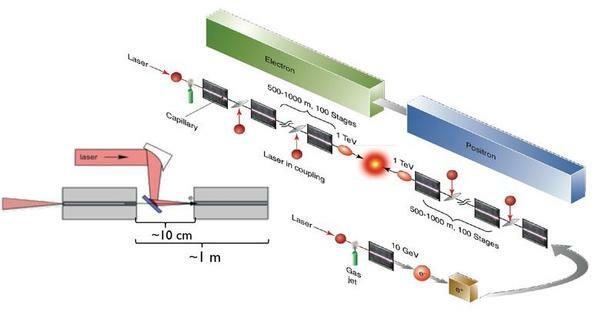 In the first place designed as source for time resolved electron diffraction experiments, beam parameters of REGAE are suitable for external injection experiments into laser induced plasmas. 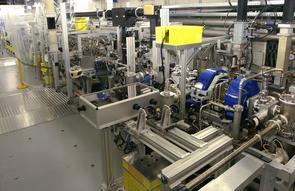 The focus of the experiments to be conducted at REGAE is the fundamental beam dynamics in a laser induced plasma. Probing the wakefield in a plasma with varying initial beam conditions allows to infer the structure of the wakefield and compare it to numerical simulation results. Besides appropriate diagnostics schemes for a as-complete-as-possible characterization of the transverse and longitudinal phase space of the electron beam before and behind the plasma accelerating stage, the synchronization of the drive laser to the electron beam down to a level of ~10 fs is one of the most challenging problems to be addressed in the frame work of this project. View into the accelerator tunnel: On the right side you see the photo cathode RF gun with the two blue solenoid magnets surrounding it and towards the left side the copper booster cavity and many different diagnostics components are located. 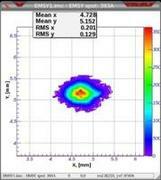 Electron beam self-modulation studies where a high density electron beam is sent through a plasma of appropriate density and the resulting energy and density modulations of the electron beam are analysed. This is a kind of pre-test for the proposed proton-driven plasma wakefield acceleration suggested at CERN. Increasing the transformer ratio and the energy transfer from a drive beam to a probe beam by resonantly exciting the plasma with a pre-shaped drive electron beam. The experiments at PITZ are prepared and will be conducted in collaboration with partners from Berkeley and the University of Hamburg. 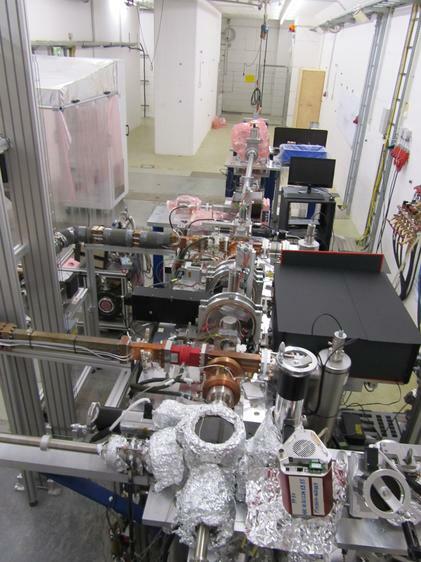 The high brightness of the electron beam together with very flexible photo cathode laser at PITZ will allow unique beam driven plasma acceleration experiments using electron beam energies of up to about 25 MeV. Image of the electron beam 5.74 m downstream of the photo cathode. The bunch charge used was 250 pC. One example of the flexibility of the photo cathode laser system: the temporal shape of the photo cathode laser pulse was tuned to produce 4 subsequent micro bunches with linear increasing charge and a fifth probe bunch. but also the best possible beam quality. Ultra-low emittance is essential if the tiny cross-sections for new physics are to be explored. The areas of accelerated beam quality and cascading plasma acceleration units will be of central interest to the working group.